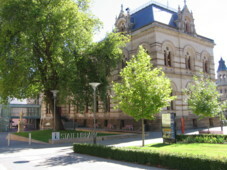 The Society and its Library are located on level 3 of the Mortlock Wing of the State Library of South Australia, North Tce., Adelaide. Tours of the Society’s library and rooms. Tours can be arranged by contacting the Library. Topics can be tailored to your groups’ interests. Tours of the Mortlock Wing. “Ambassadors” or State Library staff conduct tours of the Mortlock Wing. Public tours from 10.30am on Monday to Friday, but not public holidays. Group tours can be on any weekday morning but tours need to be booked in advance. The tours include the history and architecture of the Mortlock Wing and cover the Royal Geographical Society Library, the main chamber, Sir Josiah Symon Library, Crawford Room, galleries, conservation and reformatting sections and finish with the exhibitions. Altogether about one and an half hours. Coffee shop facilities are available.